ADAM OVERETT is a musical theater writer and performer living in New York City. As a composer/lyricist/librettist, he is the creator of MY LIFE IS A MUSICAL (2014 world premiere production at Bay Street Theatre; 2013 developmental lab production at the Duke Theatre, produced by Martin Platt, David Elliott, Cheryl Wiesenfeld, Patrick Blake, Jhett Tolentino & Joan Raffe, 2013); POPESICAL (2012 developmental production at the Lyric Theatre in LA, 2013 concert performance at Joe’s Pub, NYC); CALL IT COURAGE (based on the Newbery Medal-winning book by Armstrong Sperry), which had its premiere youth production at the Zachary Scott Theatre in Austin, TX (2010), where it was nominated for five B. Iden Payne Awards, including Outstanding Original Script and Outstanding Production of Youth Theatre; and many other works. He also contributed music and additional lyrics to the current off-Broadway hit CLOWN BAR (The Box, summer 2014, NYC) by Adam Szymkowicz. As an actor, Adam has appeared on Broadway and on national tour in THE LIGHT IN THE PIAZZA, understudying and performing the role of Fabrizio. 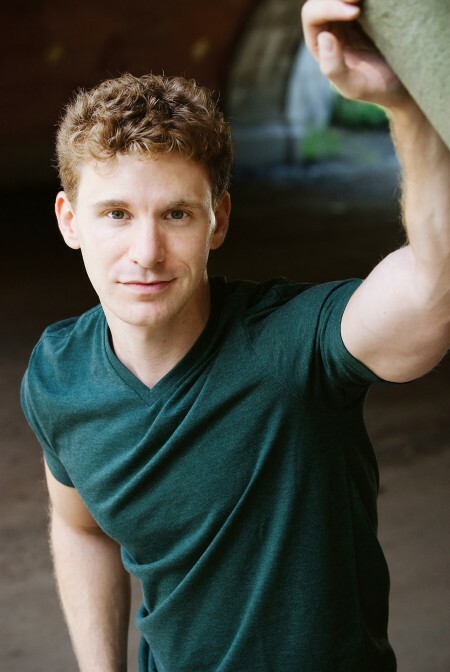 He played Neil Kellerman in the national tour of DIRTY DANCING, and is currently in the cast of MURDER FOR TWO at New World Stages, after appearing in productions of the show at Chicago Shakespeare Theatre, the Adirondack Theatre Festival, and the 42nd St. Moon Theatre in San Francisco. He originated the role of Herb in the off-Broadway show JUNIE B. JONES (by Marcy Heisler & Zina Goldrich, based on the bestselling book series) at the Lucille Lortel Theatre, and has performed in many other productions throughout New York City and the country. He has been a Musical Theater Fellow at the Dramatists Guild (2010-2011), a Lucille Lortel Award nominee for his contribution to the score of the Off-Broadway musical WE THE PEOPLE (2011), and a two-time Harrington Award winner as a member of both the BMI Advanced Musical Theater Workshop and Librettists Workshop. He has also been a resident writer at the Goodspeed Mercer Colony and CAP21 (2013). His song “My Sky,” performed by Stephanie J. Block, is featured on the album No More Revivals, released by Sh-K-Boom Records. Adam is a member of the Lehman Engel Musical Theater Advanced Workshopat BMI, where he won the Jerry Harrington Award for Excellence. He has studied musical theater writing with Tony Award-winners Lynn Ahrens & Stephen Flaherty (RAGTIME), Adam Guettel (THE LIGHT IN THE PIAZZA), and with Andrew Lippa (THE ADDAMS FAMILY), and participated in the Nautilus Workshop on musical theatre collaboration at New Dramatists in 2010. Adam has also authored the short musical MAKING THE CALL; the screenplay The Swallow’s Nest; and several plays, including PASSPORT, STANDING GUARD, and THE BIRDBATH. Adam is a graduate of Yale University, where he earned a B.A. in dramatic literature and music, and won the John Golden Prize for New Musicals. He is represented by Abrams Artists. Feb 21, 2019 – THE DOUBLE-THREAT TRIO world premiere at Pittsburgh CLO! APR 4, 2016 – LIGHT IN THE PIAZZA Broadway reunion concert! Is it ironic that the last vote McConnell needs -- McCain's -- might be delivered to him because McCain is getting ... quality health care? Congrats to EVERYONE, #TonyAwards-nominated or otherwise, who was a part of making theater in this incredible #Broadway season!!! Is "asking for a friend" over, as a phrase? Asking for a friend. [post_title] => Feb 21, 2019 - THE DOUBLE-THREAT TRIO world premiere at Pittsburgh CLO! [post_title] => APR 4, 2016 - LIGHT IN THE PIAZZA Broadway reunion concert! [post_title] => AUG 20-29, 2015 - POPESICAL is a Fringe Festival hit! [post_title] => JUL 24, 2014 - Feature in the New York Times! [post_title] => JUN 14, 2014 - CLOWN BAR re-opens at The Box! [post_title] => UPCOMING: MY LIFE IS A MUSICAL world premiere at Bay Street Theatre! [post_title] => DEC 9-10, 2012 - MY LIFE IS A MUSICAL lab  presentations! [post_title] => MAY 27, 2013 - POPESICAL in Concert at Joe's Pub! [post_title] => APR 8-9, 2013 - Encore presentations of MLIAM! [post_title] => FEB 11, 2013 - MY LIFE IS A MUSICAL reading! [post_title] => JUL 12, 2012 - POPESICAL opening in LA! [post_title] => APR 9, 2012 - Rehearsals for MARRY HARRY begin! [post_title] => OCT 19, 2011 - MURDER FOR TWO at Chicago Shakes! [post_title] => SEP 19, 2011 - Dramatists Guild Fellows showcase! [post_title] => MAR 31, 2011 - WE THE PEOPLE nominated for Lucille Lortel Award for Best Off-Broadway Musical! [post_title] => MAR 5, 2011 - Best Featured Actor nom! [post_title] => JAN 31, 2011 - My concert at the D-Lounge! [post_title] => NOV 6, 2010 - MURDER FOR TWO opens in San Francisco! [post_title] => OCT 9, 2010 - My improv debut at the Upright Citizens Brigade! [post_title] => SEP 28, 2010 - CALL IT COURAGE nominated for Best Production, Best Script! [post_title] => JUL 23, 2010 - MURDER FOR TWO opens at the Adirondack Theatre Festival! [post_title] => JUN 20, 2010 - "Leaving St. Urbain Street"
[post_title] => JUL 14, 2010 - WE THE PEOPLE premieres at Lucille Lortel Theatre! [post_title] => APR 9, 2010 - CALL IT COURAGE premieres at ZACH! [post_title] => FEB 23, 2010 - Stephanie J. Block singing "My Sky"
[post_title] => FEB 7, 2009 - DIRTY DANCING opens in Boston! [post_title] => OCT 19, 2008 - DIRTY DANCING opens in Chicago (U.S. premiere)! [post_title] => FEB 26, 2008 - Malcolm in THE FULL MONTY! [post_title] => Under new management! [post_title] => Adam as Fabrizio in PIAZZA! [post_title] => THE LIGHT IN THE PIAZZA -- Broadway debut!! © 2014 Adam Overett. All rights reserved.